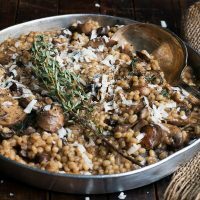 This Barley Risotto with Mushrooms features fabulously nutty pearl barley, cooked up risotto style with mushrooms, garlic and Parmesan. A great meatless main or a hearty side. I am a huge fan of barley for comfort food and it’s a bonus that it’s a particularly healthy choice, full of fibre and great fuel for all the shovelling in my future. Whether it’s in a soup or a salad, or cooked up risotto style, barley is always a great choice. 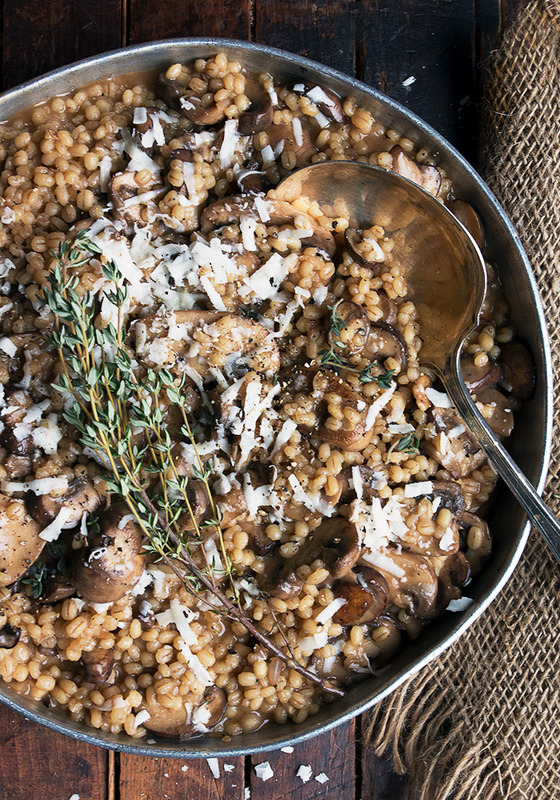 This dish cooks up the barley risotto-style, with rich beef broth, garlic and mushrooms and a touch of Parmesan. 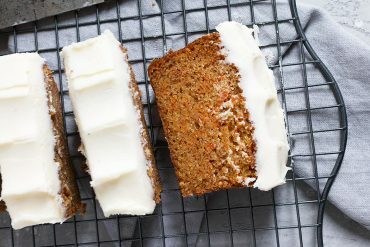 It’s full of flavour and nutty, chewy deliciousness. Enjoy this as a meatless main, or cook up a batch and enjoy as a side dish with a simple protein. It’s hearty, nutty and delicious, with the goodness of whole grains. What’s the difference between pot barley and pearl barley? All barley is husked after harvest, by running through a husking machine. Pot barley (or sometimes called hulled barley) is lightly husked, removing only the inedible outer layer and leaving the bran and germ layer in intact. As such, pot barley is the whole grain version, with the most possible nutrients. Due to the outer layer though, pot barley requires more time to cook. Pot barley is best suited for soups or stews, that will cook for a longer time. Pearl barley is left for a longer time in the husking machine, to remove the outer bran and germ layers, revealing the inner white or “pearl” coloured barley. Despite the removal of the outer layers, pearl barley is still a nutritious option and a great, high-fibre choice. Without the outer layer, pearl barley takes less time to cook, so it’s perfect for dishes that will cook for a shorter time. I have made this dish several ways, working with what I’ve had on hand, so I can tell you definitively that it’s worth picking up beef broth, rather than using chicken broth. The depth and flavour of beef broth perfectly complements the nutty barley and the mushrooms in a way that chicken broth can’t compete with. That said, if you would like to make this one vegetarian, simply substitute a nice vegetable broth and maybe consider adding a splash of balsamic vinegar for some flavour depth. While it is possible to make this dish with pot barley, it won’t cook in the specified time or with the specified amount of broth. You will need to cook longer and keep adding broth until tender, probably another 15 minutes and several cups more of broth. While this one is cooked risotto-style, you don’t have to hover over it as you would with a rice risotto. Just keep an eye on it, stir a bit and add more broth when the pan gets dry. Otherwise, it will just simmer away on the stove-top. I love to use a mix of mushrooms, even if it’s just combining button mushrooms and cremini mushrooms. The variety is nice. I prefer to start with a low or no sodium beef broth and add salt to the dish myself as I cook it. I find it much easier to control the saltiness of the finished dish that way. 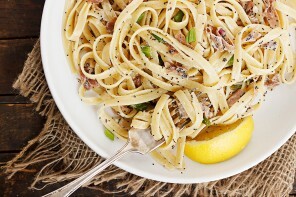 This recipe was adapted from a Food & Wine version. Delicious and filling, this is barley cooked risotto style, with lots of mushrooms and Parmesan cheese. 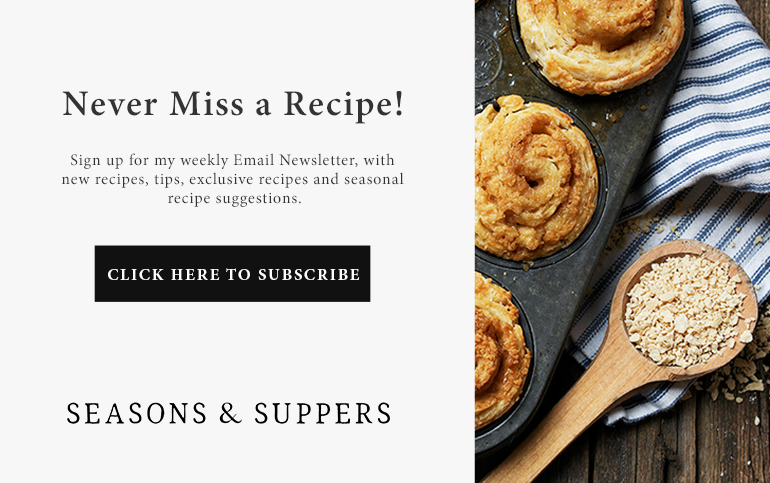 A great meatless main or a delicious side dish. Heat the beef broth in a saucepan and keep warm. In a large, deep skillet, heat 2 Tbsp of the butter over medium heat. Add the shallots and garlic and cook, stirring, until starting to soften. Add the mushrooms and thyme leaves and season with salt and pepper. Cook, stirring regularly until mushrooms are tender and lightly golden, about 5-6 minutes. Add the barley and the remaining 1 Tbsp butter. Cook, stirring, for about 1 minute. Add the wine and cook until the wine is absorbed, 3-4 minutes. Add 1 ladle of the hot beef broth and stir to combine. Cook over medium heat, stirring once or twice, until nearly all of the broth has been absorbed. *You don't want to boil the mixture too vigorously, but you do want a consistent simmer. Adjust heat to that point.Continue adding ladles of broth one a time, allowing to cook until the liquid is absorbed before adding another. Cook until all the broth us added. Test the barley. You want it to be al dente. If it is not quite there, add another ladle of hot water and cook a bit longer. When cooked, stir in grated Parmesan cheese and stir to combine. Season dish with salt and freshly ground pepper, to taste. 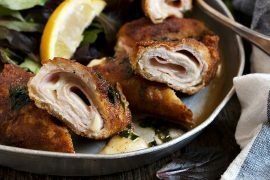 Serve with Additional grated Parmesan and garnish with fresh thyme sprigs or fresh thyme leaves. This looks amazing! I only have hulled barley – do you know if that would work as well? Hi Kathrin and yes, it should work with adjusted cooking time (longer simmer of maybe 15-20 minutes). It may benefit from a soaking ahead of cooking. If you use it often, just use your best judgement there. was wondering if i can make this in advance? Maybe a night before or in the day and serve it for dinner? any storage and reheating tips? Hi Upasana, I have never tried to make this one ahead. My concern would be that the barley would dry out. But that said, if you wanted to try it, I would add a splash of additional broth to it while re-heating on the stove-top. Recently made with the now available mushroom broth. Have found that rinsing the barley has allowed 1.5 cups of barley to be used with the 4 cups of broth. 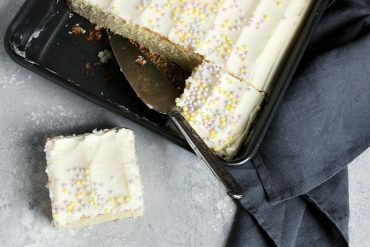 Making this for the second time today and I just love it! I didn’t have any beef broth but using chicken broth turned out just as delicious. 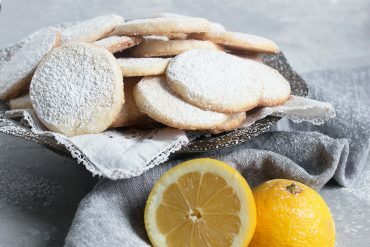 Thank you for this easy, yummy recipe! So glad to hear and thanks! I actually prefer chicken broth myself with this one. 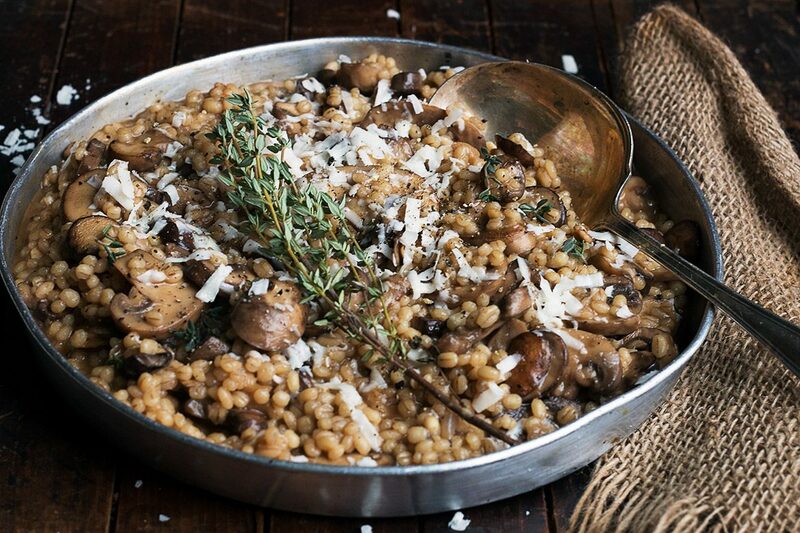 Barley, risotto & mushrooms – a must try! Used button mushrooms & cremini. Think I’d use just the cremini next time as the button mushrooms were small & a pain to clean. Thoroughly enjoyed the first serving as a meatless main. The second serving was on the scant side so decided to add store-made garlic/apple sausage. Thanks Irene and yes, button mushrooms are a pain to clean, aren’t they! 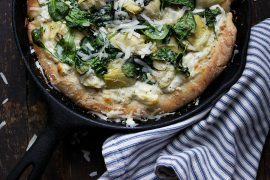 I’m with you there :) Love the idea of using the left-overs with garlic-apple sausage. A perfect flavour combination! I absolutely LOVE risotto, but I’ve never made it with barley! I’ve been missing out! This looks just incredible, Jennifer! Can’t wait to try it! Cheers!! I think you would love the barley, Cheyanne! Such a nice change and great texture :) Thanks! We loved the flavour and texture of this risotto. I served it with mashed sweet potatoes and peas. So glad to hear, Elizabeth :) Sounds like a perfect meal :) Thanks! I am so excited that you plotted this barley risotto, Jennifer:) It looks perfect for a snowy day, plus you know how I feel about barley:) I will happily pair it with a rich barley drink (I am thinking a glass of barley wine, or a boozier brown ale, or a bock) and indulge to my heart’s desire. Your kitchen must have smelled soooo good while this was cooking. I do know how you feel about barley ;) And yes, a great pairing, for sure! I was just wishing for snow myself! Not sure if you were wishing for it – but hope you enjoy. I’m such a nut for mushrooms, and just finished making a mushroom laden casserole. 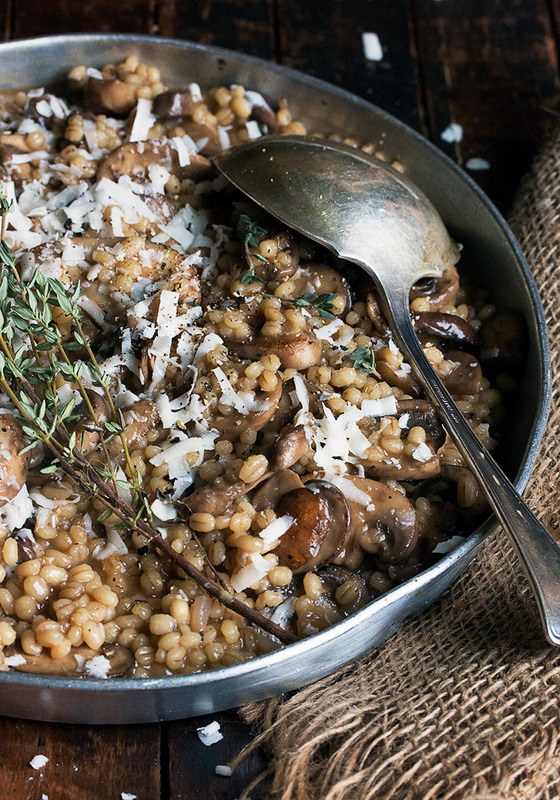 Now I want to make this gorgeous risotto style barley. 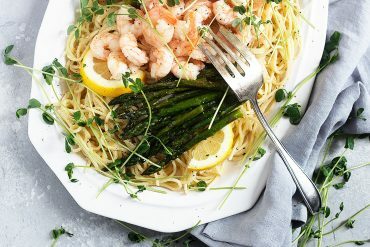 Such a fantastic winter dish! I’ve got everything but the barley and that’s easy enough to fix! Stay warm Jennifer. This is making my mouth water and I’m not even that hungry! I love this combination of flavors and beautiful textures. Parmesan is such a nice way to finish it off! Stunning and mouthwatering! My husband goes crazy for mushrooms, and so do I, so we’ll be having this soon. Love your skillet presentations! Now that’s a Sunday kinda dish if ever there was! 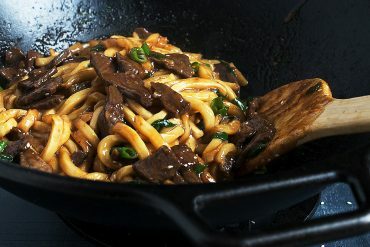 Love the addition of meaty mushrooms! Thanks Annie and yes, lots of mushrooms makes this perfect for a meatless dinner! Love this cozy dish Jennifer! So nice and hearty. Perfect with a glass of wine!